You can add as many attributes as needed. 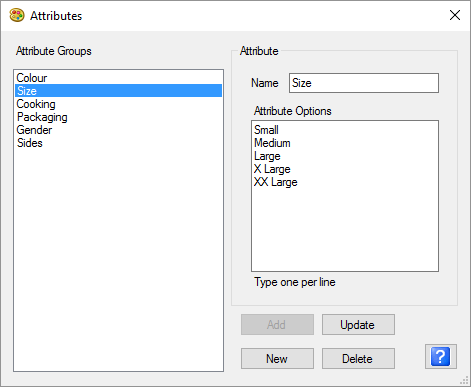 Each attribute can have any number of options. Enter one option per line and only enter a word (no other characters like commas). Product variants are mostly used on the retail side but can also be used in the restaurant module if needed. Color (or Colour depending on your country): Black, White, Blue, Red, etc. To See how product variants work, click on Product Variants. Order Attributes are mostly used on the restaurant side but can also be used in retail.